Home › Tips for Dating › Who accompanies you to your single’s events to find love? How you show up determines how well you connect with people. Many times you may hear negative voices offering you some kind of warning, “Only losers would come to this event” or “There are only the rejects here”. Here you are bringing your judgmental or snobby gremlins with you. Or you may be bringing your fearful gremlins with you who may be telling you, “Be careful, the guys here only want one thing!” or,”The women are going to reject me, so why bother?”. All these negative attitudes won’t serve you to find love and will keep you from really participating and getting to know the people there. How about bringing the confident you to the event? This is the part of you who knows that you can engage in friendly conversation and start building relationships. I encourage my clients to be open and to stay curious about others. You are just developing connections – that’s it. Then, over time, if there is interest, then you may decide to explore a possible relationship, if the interest appears to be mutual. Or perhaps a friendship can blossom. So who do you choose to bring with you the next time you venture out to a new group of try a single’s event to find love? Who usually shows up and how do you plan on picking the right wing thoughts the next time you attend a new group or an event? This curious coach would like to know! Please leave your comments below. PS. 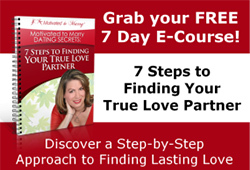 If you want more dating tips to find love, go to www.MotivatedtoMarry.com and sign up for my free 7 Day e-course, 7 Steps to Finding True Love. ‹ Do you feel you are a Sleeping Beauty who just woke up at 40 still looking to find love?